University of Georgia Tartan Luxury Scarf. Poly scarf. Measures 60" x 11 3/4". Dry Clean Only. University of Georgia Tartan Silk Pocket Square. 100% Silk. Made in Italy. Dry Clean. 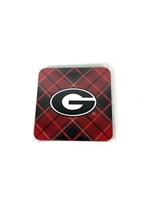 University of Georgia Tartan Coaster Set 4-Pack. Cork back. Made in USA. University of Georgia Tartan 214 Bucket Tote. 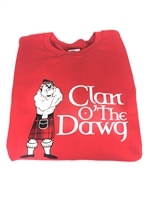 Perfect for tailgating or anytime you need a tote and want to show your UG pride! Two pockets - one on each side for wine or beverage of choice. Made in America. Measures 12.24" height, 5 x 10 bottom and 36" circumference. University of Georgia Tartan Silk Bow Tie. 100% Silk. Adjustable to 18". Made in USA. Dry Clean. University of Georgia Tartan Silk Tie. 100% Silk. Measures 58" x 3 1/4". Made in USA. Dry Clean. University of Georgia Tartan Lambswool Scarf. Measures 79" x 12" plus 4" fringe. Made in Scotland. Dry Clean. Scottish quality made to last. For men and women in the popular length for knotting around the neck for style and warmth. 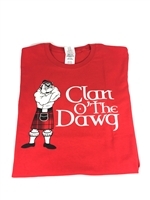 Add a splash of color to any outfit with your University of Georgia Tartan Lambswool Scarf! University of Georgia Tartan Men's Dress Kilt. Custom made in Scotland. Eight yards of University of Georgia Tartan fabric, hand-stitched pleats in back and lots of attention to detail making this kilt the finest quality. Delivery 6 weeks. Collegiate Tartan custom clothier will call you to discuss your custom kilt measurements when the order is placed. Made in Scotland. Dry Clean Only.